There is no reason Valentine’s Day has to leave you short on cash! Here are a few things our family did this year that might inspire you for next year. This is a divine chocolate cake made from the recipe on the back of the Hershey’s cocoa powder box. If you bake at all, you probably have the ingredients in your pantry. 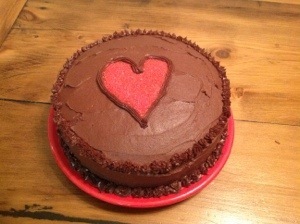 If you use a different brand, the recipe is at http://www.hershey.com, recipes, under “Perfectly Chocolate” chocolate cake. This next one is precious and so encouraging! 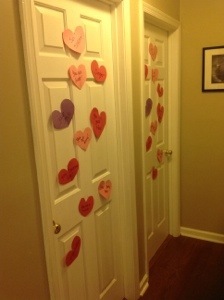 At the beginning of February, I began writing a trait I love about each boy on a construction paper heart that I would tape on their door at night. I wasn't sure they would care, but every morning they would jump up and check their door! I would include things like their sense of humor, imagination, and other things like how well they give hugs! Lastly, for my husband, I found this awesome graphic from HarperAvenueDesign on Etsy through Jane.com. 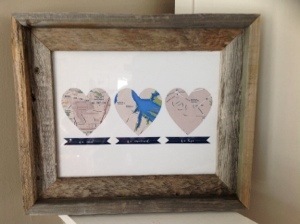 The personalized graphic is only $10 and includes a heart shaped map of where you and your love met, married, and live. I love it because it celebrates our history!